In Zionsville, clients turn to Frank & Kraft for help with all of their elder law and estate planning issues. Our legal team provides the types of comprehensive help and support that people of all ages need to make an appropriate incapacity plan, asset protection plan and legacy plan. While you may assume these are issues affecting only seniors, the reality is that anyone could face illness or injury and not having advanced plans can make life much harder for families during these troubled times. Frank & Kraft will work with you to make a plan for a bright future, through using specialized tax-advantaged retirement accounts and making smart choices to invest and keep your wealth safe. We also provide the help that you need to prepare for end-of-life issues and to create a strong legacy. Give us a call today to find out more about the many ways in which our firm helps clients in Zionsville with making effective use of legal tools to plan for whatever comes their way. Zionsville is a town located in the southwestern part of Boone County, Indiana. It is a suburb that is a part of Eagle Township and it is to the northwest of Indianapolis, which is Indiana’s major city. According to the most recent census estimates of the population, there were more than 26,000 people living within Zionsville. Zionsville has a downtown area styled after old fashioned villages, which is very popular with tourists. There is a brick Main Street that is lined with many different restaurants and stores which people from surrounding areas in Indiana come to enjoy. Zionsville is 15 miles from downtown Indianapolis, and the suburban town spans almost 11 square miles, almost all of which is land with only .37% of the town’s area comprised of water. Zionsville hosts a local July Fourth Fireworks show each year organized by the Lion’s Club. There are concerts before the fireworks display. Zionsville also hosts an annual Fall Festival, which includes a parade with marching bands and school sports teams from around the area, along with rides and other attractions. The services offered include transportation, information and referrals for seniors who need intensive care, respite care and caregiver supports, programs matching seniors with “friendly visitors,” and other activities and workshops that seniors in Zionsville can take part in. Many of the programs are intended to help seniors maintain the strongest connections possible to their communities and to facilitate the assistance that seniors need to live independently for as long as they can. Frank & Kraft helps seniors, and people of all ages, to make an estate plan that is aimed at avoiding probate court. Through the creation of an incapacity plan, you can determine who will make decisions on your behalf if you are not able to act on your own due to illness or injury. This allows your family members to avoid guardianship proceedings if something happens to you and you cannot act on your own. We also provide assistance with the creation of an estate plan. Depending upon the specifics of your family situation and the assets that you own, you may wish to use tools in your estate plan that allow you to transfer assets outside of the probate process. This would spare your loved ones the time, stress and costs of probate court proceedings. There are, however, certain circumstances in which it becomes necessary to go to probate court. If someone you love has passed away and advanced plans were not made to avoid the probate process, probate court proceedings are necessary to facilitate the distribution of assets. If someone has become incapacitated without an incapacity plan, guardianship proceedings will become necessary. 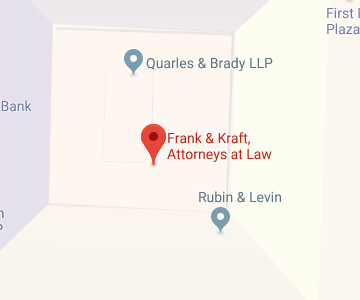 Frank & Kraft can represent you during probate or the guardianship process, and our legal team will take care of all of the technical aspects of dealing with the probate court on your behalf. Probate proceedings must take place in the probate court that is located within the county where the incapacitated person resides or where the deceased person owned property. For those in Zionsville, this would mean that probate proceedings must take place in Boone County. The Boone County probate court is part of the Boone Superior Court, which has criminal, civil, and probate jurisdiction. Boone County Superior Court I has “exclusive jurisdiction over probate cases,” according to the Court’s website. The County Clerk is the record-keeper for probate proceedings in Boone County, and is located at 212 Courthouse Square, Lebanon, Indiana 46052. The County Clerk for Boone County can be reached at 765-482-3510. Our firm can provide you with assistance throughout the entirety of your involvement with the Boone County probate court system. We can advise you on the process, file paperwork on your behalf, and help you to complete all of the technical requirements associated with guardianship or with winding up the affairs of an estate and transferring assets to new owners. Zionsville estate planning and elder law attorneys at Frank & Kraft can work with you to make plans to address the goals that matter to you. We help people at all ages and income levels to grow wealth, protect assets, and ensure their autonomy and family are as safe and secure as possible in case of sickness or death. We provide compassionate advice to make the process of making your plans as simple and stress-free as possible. To find out more about the assistance that we can offer you, give us a call at 317-684-1100 or contact us online at your convenience to talk with an experienced attorney and to get personalized legal advice about the issues that matter to your future. Call now to get started.